Edinburgh City’s Liam Henderson says victory tomorrow over Peterhead would round off a perfect couple of days for the defender. 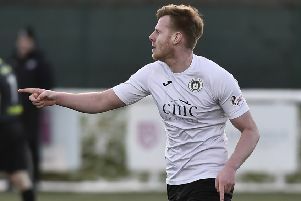 The 22-year-old penned a new deal earlier this week, committing himself to the Citizens until summer 2020, a big boost for manager James McDonaugh ahead of this weekend’s top-of-the-table clash at Balmoor. Henderson has been a mainstay at the heart of the City defence, forming a formidable partnership alongside Conrad Balatoni. The Capital outfit boasts the best defensive record in League Two, a statistic that Henderson admits he and his team-mates pride themselves on. The City players will hope to keep their goal intact tomorrow and secure a victory that could stretch their lead at the top to seven points. And Henderson feels just in the right mood following his own personal high. “The club have been great to me. I left to go to Australia when I was here last season and they took me back in the summer so it was no-brainer to give a bit of loyalty back to the club,” Henderson explained. “I’d been talking to the chairman and the manager for a couple of weeks so it was just a case of getting things sorted, which I’m delighted about. “Things have been great this season. We’ve come a long way in a short space of time considering the new players that arrived in the summer. No one would have expected us to have been up at the top of the league for so long. We’ve still got the Irn-Bru Cup semi-final to look forward to next weekend so it’s exciting to be a part of. City’s previous venture to the Blue Toon saw them emerge 1-0 winners in September, top goalscorer Blair Henderson’s second-half strike turning out to be the only goal of the game. And Henderson, Liam that is, insists they are confident of returning south with a similar outcome. “I think last week’s win over Albion has done us the world of good because we hadn’t won at home this year. We’re all on the same page and know where we want to be come the end of the season. “It’s a massive game tomorrow. It really could define our season. We can’t go up there and get beat. We’re not going up there to sit in and defend. We’ve beaten them there already this season so why can’t we do it again? They will also know just how big a match this is in the context of the season. “Clyde have also gone about their business quietly and are right back in it. It’s really tight. They weren’t really in the picture a month ago so it’s still all there to play for. “I think having one of the best defensive records in the UK earlier on in the season is up there in terms of achievements we’ve had this year. As a defender you pride yourself on clean sheets. But nothing is won just now. “I’ve loved every second so far. It’s been great playing in a settled back four and Conrad has been brilliant this season. I’ve learned so much from his experience, whether it be at training or in a match. He’s very approachable too so you can always go and ask him what you’re doing right and where you can improve.